It’s 2014, and a national magazine has a cover story about how African immigrants might spread a deadly virus in the United States, thanks to the peculiar and unsanitary food they eat. 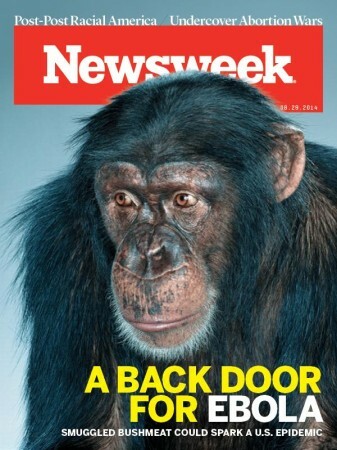 The cover image is a photo of a chimpanzee. But is there any evidence that imported meat could actually carry Ebola? On that score, Newsweek comes up empty. The article cites a “memo obtained by Newsweek that circulated among customs officers and agriculture specialists in 2007 [that] noted that bushmeat is ‘a potential vector of diseases such as Monkeypox, Ebola Virus, Severe Acute Respiratory Syndrome (SARS) and other communicable diseases. '” Who produced this seven-year-old memo? Newsweek doesn’t say. Despite the fears over bushmeat, Swanepoel says study of Ebola and Marburg outbreaks since 1976 indicate it is close contact with bats in particular that seems to be behind the transmission to humans of the deadly virus. While the focus remains on the passengers of trans-Atlantic flights, there is an additional risk—all but ignored by the popular press and public—lurking in the cargo hold below: bushmeat contaminated with the virus and smuggled into the US in luggage. Far from presenting a legitimate public health concern, the authors of the piece and the editorial decision to use chimpanzee imagery on the cover have placed Newsweek squarely in the center of a long and ugly tradition of treating Africans as savage animals and the African continent as a dirty, diseased place to be feared. I would say that the risk for contracting Ebola by eating or handling bushmeat that arrives in the U.S. through illegal importation is minimal. But that doesn’t mean it is a zero risk. Newsweek’s piece is in the worst tradition of what journalist Howard French calls “Ooga-Booga” journalism: the practice of writing in exoticizing and dehumanizing ways about Africa.